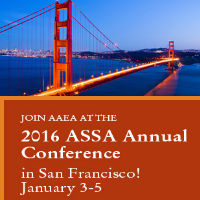 President-Elect Jill McCluskey is soliciting proposals and suggestions for AAEA invited paper sessions at the 2016 Allied Social Sciences Association (ASSA) Annual Meeting in San Francisco, CA, January, 3-5, 2016. Preference will be given to those proposals that add to knowledge on public issues of national and international importance or expand capabilities and tools for economic research. The objective of AAEA sessions at the ASSA Annual Meeting is to share new knowledge with members of other economics associations as well as with AAEA members. Sessions may be jointly sponsored with other ASSA member associations. AAEA encourages sessions that will draw widely from ASSA attendees. Therefore, preference will be given to proposals that jointly serve the interests of the AAEA and other economists more broadly. Papers in these Invited Paper sessions will be considered for publication in the American Journal of Agricultural Economics in August 2016. Preference will be given to proposals that reflect a commitment to furnish a high-quality collection of papers suitable for publication. Papers will go through a review process, and it is not guaranteed that all papers in an accepted session will be published. Papers submitted for review should be in their publish-ready state because there will not be time for multiple versions and reviews. Discussant comments will not be published. Authors will be contacted by the AJAE editors regarding style and length of manuscripts to be submitted to the editors for publication consideration. Proposed session formats with three papers and one discussant or four papers without a discussant are permitted. Proposals for sessions without a discussant must include a clear plan for ensuring and fostering participant interaction. Please note that sessions at ASSA are two hours in length. Proposals will be reviewed and selected by a subcommittee of the AAEA Board. Proposals should be submitted to Kristen Wright at kwright@aaea.org. They should include the proposed session title and paper titles, as well as the names, addresses, phone numbers, and e-mail addresses of the session organizer, moderator, paper presenters, and discussants. A brief (approximately two pages) justification of the session, and one paragraph abstract describing the objective of, and new knowledge generated by, each paper, should also be included. It is the responsibility of the organizer to ensure that all individuals identified in the proposal are willing to participate. All presenters/speakers/discussants must be members of AAEA. A membership waiver request can be included in the proposal in the case of extenuating circumstances. In addition, participants need to register for the ASSA meeting. AAEA cannot grant registration waivers for the meeting. Please send proposals by May 1, 2015, in Word or PDF format to Kristen Wright at kwright@aaea.org.